The California Science Center in Exposition Park this morning welcomed Space Shuttle Endeavor Commander Mark Kelly (husband of Arizona Congresswoman Gabrielle Giffords) and three other mission astronauts at a private ceremony for Endeavor’s title transfer from NASA to the Science Center. Also on hand to celebrate were L.A. Mayor and Metro Board Chair Antonio Villaraigosa and L.A. County Supervisor and Metro Board Member Mark Ridley-Thomas. Today may only be a paper event but it indicates that the real shuttle is on its way home to the state where it was designed and built 20 years ago. The Shuttle itself, which blasted off for its final trip into space this May, will take its place at the Science Center next summer. The Center first needs to raise some $200 million to transport Endeavour to L.A., move it from LAX to the Science Center (this will be accomplished with a big parade … which ought to be fun) and build a suitable display structure adjacent to the Science Center. But the timing is perfect. With the Exposition light-rail line opening next year, the Expo Park/USC Station will be just steps away. $200 million to transport the shuttle? 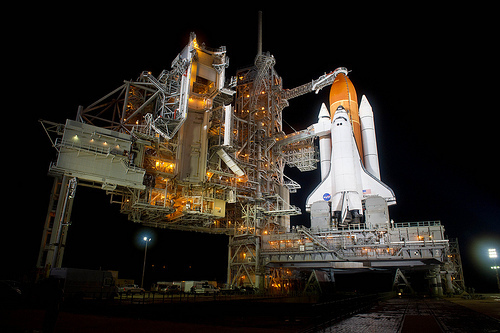 Actually, it’s about $200 million to transport and build a structure to house the shuttle. It’s pretty big and won’t fit just anywhere. But the Science Center is lucky to get it. It will be a huge attraction and it’s scientifically and historically important to California. Think of all those little kids going to visit and planning their futures as the scientists and astronauts of tomorrow. Thanks. Light rail won’t open until next year?? How many times will you guys push it back?? I’ve been waiting for the last two years to take my five year old nephew on a train ride from Upland to Exposition Park. The delays in the Expo line is becoming problematic.